When I was a counselor I agreed to teach Rider Return classes for Probation and Parole, counseling and teaching men how to successfully ease their way back into society after they got out of prison. It was difficult for those guys. Few people wanted to hire them or rent to them. In many cases, their families had moved on and they were facing their new life alone. I taught my class in the evenings after my eight hour day in the office. The men left at nine P.M., leaving me alone in a large, hollow-sounding, dark building. On one occasion I walked to the door with the class and after they left, I locked up. Just as I started back to my office to retrieve my purse I became aware that I wasn’t alone. One of the class members had hidden in the restroom until the others had left so he could “talk” to me. Luckily he wasn’t one of my dangerous clients, but it took some fast talking to finally convince him that we weren’t made for each other and that I hadn’t been secretly wishing I could be alone with him. Each class night, one of the men came in and quietly sat in the back, not sharing his story as many did, and not asking for help or aid in comprehension of lessons. I often wondered how he’d survived in prison with his shy and quiet ways. In class, he wasn’t accomplishing any of the goals he’d made when he started the program. One evening he walked into class with a totally different countenance, big smile spread across his face and a bounce to his step. After class started he raised his hand and asked if he could share something. A few days before class he’d rescued a young boy from drowning. He was a hero. The media had gotten a hold of the story and it was coming out in the newspaper the evening of class. “It’s the first time my name has been in the paper when it was positive and where the picture of me wasn’t a mug shot,” he told us proudly. After that day I watched him change. He began working on his goals, participating in class, dressing better, and ended up getting a good job. After classes from then on, he took the initiative to check out the building to make sure it was safe before the class left me alone. Being a hero instead of the villain had changed his whole concept of who he was and he began to succeed. Although I was the teacher, he taught me a great lesson. Sometimes we have to get out of our own way in order to succeed. If we feel we don’t deserve success, if we feel unable to succeed, or if we’re afraid success will change our life and take us out of our comfort zone, we will sabotage the very thing we want the most. Who we think we are is often imbedded deep in our subconscious where it’s difficult to change those negative notions we have about ourselves. The good news is, our subconscious believes whatever facts we give it, whether true or not. You’ve fed it all your fears, failures, and reasons why you can’t succeed all those years, now it’s time to let the positive overcome the negative. Have you heard motivational speakers talk about visualization and affirmations? You can visualize yourself being a big success. You can tell yourself how great you are. You can dilute all those negative self-concepts with positive ones. Going back to my client who became a hero, it completely changed his life. You may not get the chance to save someone else as he did, but you can save yourself. You can make your dreams come true. Visualize and affirm and with the awesome power of your subconscious mind, you’ll start getting ideas. As you follow through, you’ll have little successes that lead to bigger successes and one day you’ll see your goals accomplished. You’ll be a hero. So why, knowing all this, haven’t I become famous or a multi-millionaire? The way we think about ourselves has become a habit. It’s a habit as difficult to overcome as drugs, smoking, or not exercising and eating healthy. I hate to think of how many times I’ve lost weight, let down my determination, and put the weight back on again. Then I had to focus my efforts once more. I can say the same about my successes and failures. I’ve had my share of failures and I’ve had some wonderful successes. Jeez, I was making it all sound so easy. Then I had to go and spoil it by writing that last paragraph. I guess it comes down to the ever important question, how badly do you want your goals? Think about how you’d answer that question while I get busy. I need to exercise, meditate, visualize, say my affirmations, and check out my vision board. Are you one of those people who always seems to be taken advantage of? Or do you have friends or family who take you for granted? When I was counseling I had at least one client a day who complained that their spouse, a friend, or someone in their life mistreated them. The truth is we train people to treat us the way they do. If someone in your life has mistreated you and it paid off for them they're going to do it again. When it's something really bad we hear, "Please forgive me. I'll never do it again." When they do it again, often we make excuses for them, or we make excuses for ourselves for staying and condoning the action. And we ask, "He's supposed to love me. Why would he do that to me?" And the answer is, because he can. If you really want to be treated with respect in your relationships, here are a few steps you need to follow. 1. Decide what's important to you. Make rules about how you want to be treated. Say to yourself, I'll put up with this and this, but I'll never put up with that. 2. Tell the other person what your rules are. You can't expect them to treat you a certain way if they don't know your expectations. 3. Oprah has said many times, "When someone shows you who they are, believe them the FIRST time!” If you follow that advice you won't end up feeling as though an abusive relationship, whether physical or emotional, slipped up on you. There are signs in the beginning of all relationships that give us an idea of who that person is if we'll only heed them. 4. Honor yourself. If something hurts you, makes you feel uncomfortable, or makes you unhappy, it must go. If you don't honor and respect yourself, others won't either. 5. Mean what you say and say what you mean. Be honest. Tell the truth. If someone hurts you and you say, "If you ever do that again, I'm leaving," and they do it again, leave. If you can't take that final step, then don't ever threaten it. 6. Don't make excuses for the other person to yourself or others. Call them on their bad behavior. If it continues and it damages who you are, move on. 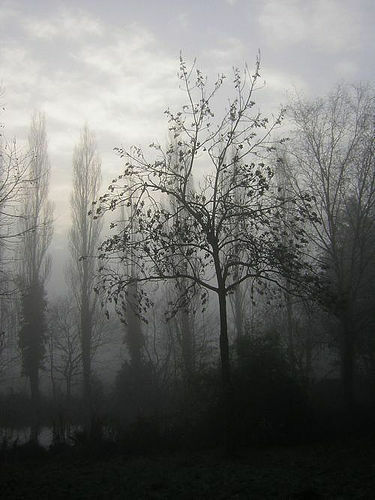 For this blog site title I compared my thoughts to shadows in the fog. If I were in Idaho, I could say my thoughts are as clear as the air on a crisp, wintery morning. If I were still in Arizona, I could say they are as substantial as the granite spears that jut up from the desert floor. 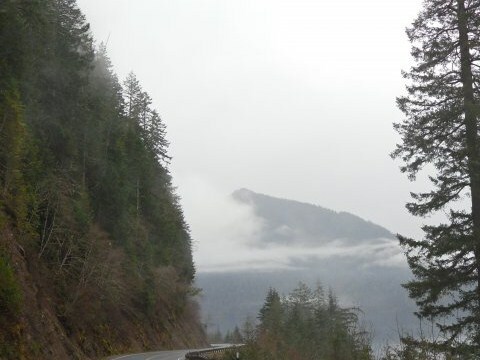 But no, I'm on the Washington coast and, in the winter, after the fifteenth or sixteenth day of rain, my mind starts to fog over, as do the tree-covered hills, and sandy shores. My first year here I was depressed. Now, I take my vitamin D and relish the moody, murky dawn and the rhythm of rain. These mornings are the best times to write, when everyone is asleep and it's quiet except for the tapping on the roof. I go to my computer, cup of tea in hand, and sit down, close my eyes, and let the fog roll through my mind. Others must agree that this is a good place to write. Some of my favorite authors compose their novels here. And, did I mention? Watery winter mornings are also an excellent time to sit down with a good book. Once I went walking on the beach near Forks, Washington. There was a storm brewing and the electricity in the air made the hair on the back of my neck stand up. The energy of the storm pulsed through me, causing my nerve endings to tingle with excitement. Fog covered the area, making the mounds of sand and rolling ocean waves shadowy and surreal. It is a moment in time, seemingly insignificant, that I will never forget. Life should be gulped, not sipped. Maxine is the author of a psychology book, "Reality For Parents of Teens." She has written numerous articles on drug and alcohol rehabilitation, how the brain works, and setting and accomplishing goals. She has authored lesson manuals for teaching classes on cognitive self-change. Maxine attended college at the University of Nevada, Las Vegas and Idaho State University. She counseled for a women's program, Discovery House and for Road to Recovery, a men's and Women's drug rehabilitation program. She taught prison rider return classes for Probation and Parole in the state of Idaho, taught in the women's prison, and worked with Child Protection Services in Idaho as well. Maxine lives in Vancouver, Washington, and writes fiction novels.